I like to keep frozen raw shrimp in my freezer so I always have a quick cooking protein option on hand. I have a serious love for seafood, and I find that shellfish keep better in the freezer than say, salmon fillets. Plus they often go on sale as BOGO at my store, so I make sure to stock up when they do. They are great on those nights when you get home late and want to make something healthy and quick, and haven’t planned ahead and thawed anything else out. Run them under a little warm water for a few minutes, and you are good to go! You may have noticed I have a love for any sort of Asian inspired cuisine. Who doesn’t love a little sweet & sour pork when they get Chinese take out? I know, it’s probably horribly westernized, but I’m okay with that. The great thing about a basic sweet & sour sauce is you can use it with pretty much anything – meatballs, chicken, tofu, and shrimp. 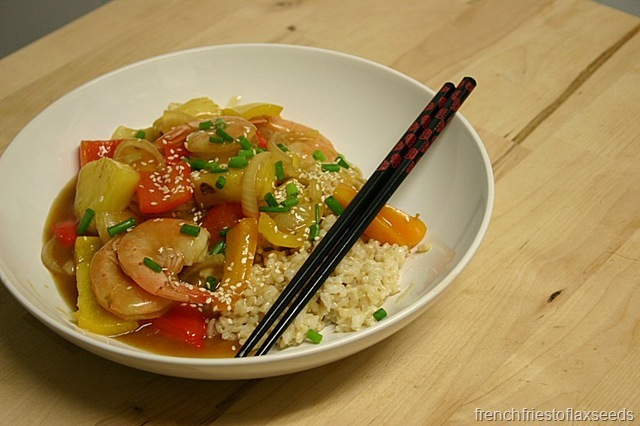 My go to sweet & sour sauce recipe is one I’ve been using since Foods class in grade 9. I may have tweaked the amounts of ingredients over the years, but it has yet to let me down. So one night I found myself with a fresh pineapple, a few bell peppers, and a hankering for a tasty stir fry. By the time my coconut rice had cooked, I had this colourful plate of deliciousness. It is the perfect balance of sweet, sour, and a little bit of bite from the peppers (yes, even sweet bell peppers still have a peppery bite – or maybe I’m just overly sensitive to them). It paired beautifully with the creamy rice coconut brown rice (just brown rice cooked with half coconut milk, half water). You can’t go wrong with a quick cooking gourmet meal on a weeknight! 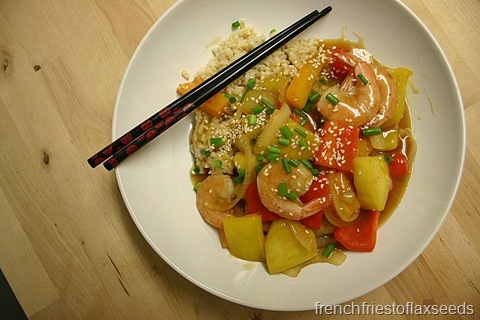 The perfect balance of sweet, sour, and spice – this dish is a rainbow of colours and flavours. Fancy enough for company, but easy enough for a weeknight meal. 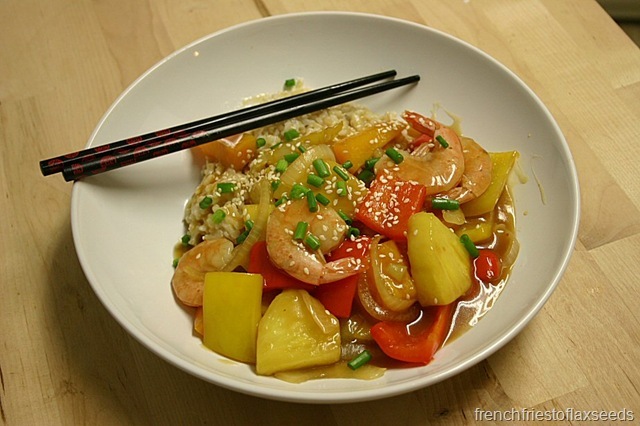 Pair with some brown rice, and you’ve got one nutritious and delicious dish! These amounts are pretty flexible – the recipe is very forgiving. Just mix to your perfect balance of sweet and sour! 1. Heat a wok or large sauté pan over medium-high heat. Heat oil in pan. Combine chicken broth and cornstarch in a small bowl, mixing well. Set aside. 2. Add onions and garlic, and stir fry for a couple minutes, until they start to soften. Add peppers and stir fry for 2 – 3 minutes. 3. 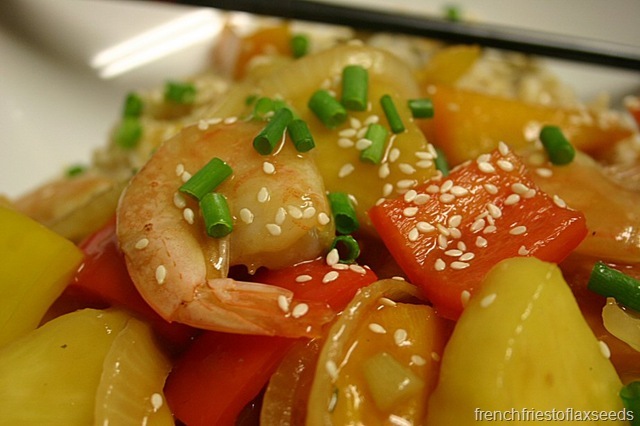 Add shrimp and pineapple, and stir fry until the shrimp start to turn pink. 4. Add pineapple juice, chicken broth/cornstarch mixture, sugar, soy sauce, white vinegar, and red pepper flakes (if using). Cook until the sauce boils and becomes translucent and thick. 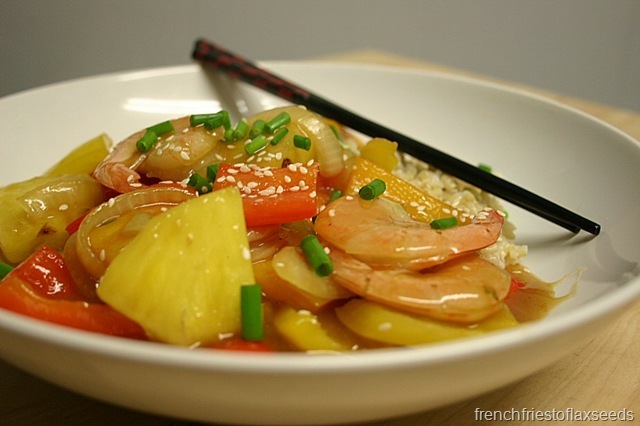 Serve over rice, and garnish with sesame seeds. Notes: If you used canned pineapple, just use the juice from the can, and add water to make it up to 1/2 cup. If you use green bell peppers, it will have a little more bite, but look even more colourful. What’s your favourite Chinese food dish? This sounds amazing! Stir fry’s are the best meals when you want something fast, aren’t they?